This bean sprouts recipes article talks about the difference between soy and mung bean sprouts: their nutritional and medicinal values, how to choose, clean, and cook them in 5 different ways, and if you are interested, how to grow them. 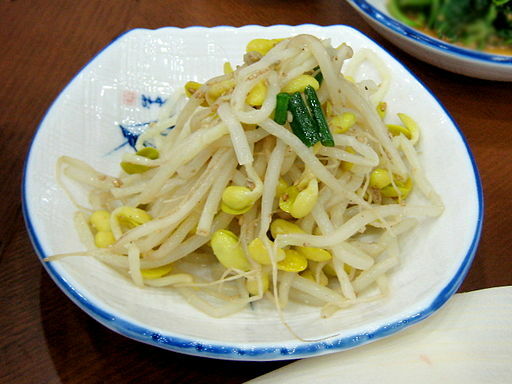 When a Chinese person talks about bean sprouts 豆芽 (dou ya), they typically refer to two types: soy bean sprouts 黄豆芽 (huang dou ya) and mung bean sprouts 绿豆芽 (lui dou ya). I am most familiar with mung bean sprouts when growing up. Granny loves to fry them with some garlic and chives or dried tofu cubes. She also like to use them in noodle soups or meatball soup. They are very cheap, only about 50 cents for one big bag. 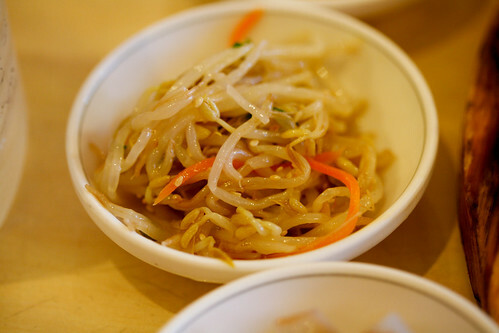 I encountered soy bean sprouts when Korean cuisine became popular in Singapore. I see them in bibimbap and as pickled side dishes at Korean restaurants. Both types of bean sprouts are very healthy. It is low in calories; about 23 calories per 100g of sprouts! Yet they pack a punch in the nutrients department. High in protein with many trace minerals and vitamins. Both are mild tasting, in my opinion. They are relatively easy to prepare and can be added to a wide variety of dishes. Throw them into soups (my favourite), stir fry them, add them to wraps or savory pancakes, steam or blanch them with some natural vinegar, or juice the mung bean sprouts. Green bean sprouts are also known as mung bean sprouts. It is the most common sprouts used in Southeast Asian cuisine. In traditional Chinese medicine (TCM) green bean sprouts is considered cooling and detoxifying. It helps dispel summer heat and harmonizes the 5 major organs. 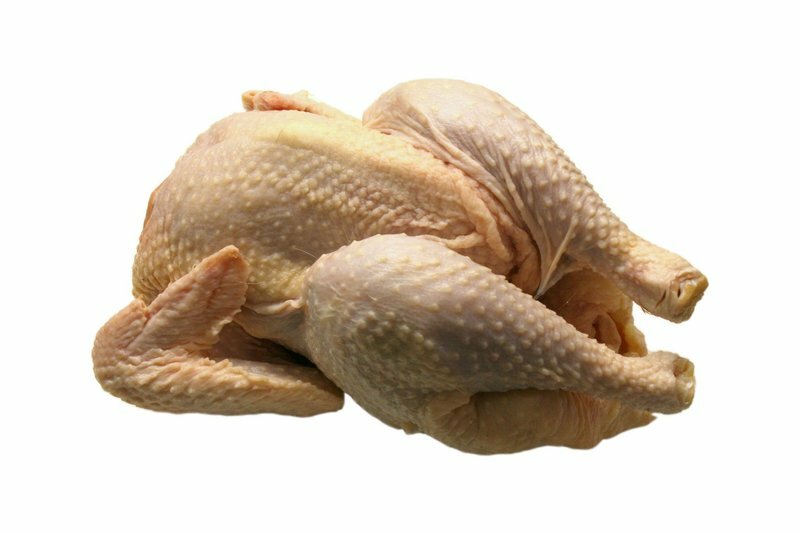 As natural remedies, it is commonly given for hangovers, discomfort from the summer heat, lack of appetite, and general lethargy. People with high blood pressure and coronary heart disease can eat it more frequently, especially during the summer months where high temperatures may add additional stress to the body. People with urinary tract infection or experience burning sensation when urinating can also try juicing mung bean sprouts. Japanese researchers found that serving chives with mung bean sprouts can help constipation amongst the elderly and children. 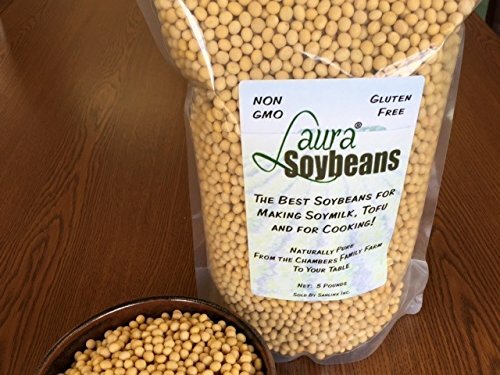 It is also beneficial for people with conditions caused by deficiencies in Vitamin A, B2 and C.
Sprouted from soy beans, these are very common in Northeast Asia, especially in Korean cuisine. So far, I haven't seen a Korean dish without soy bean sprouts. 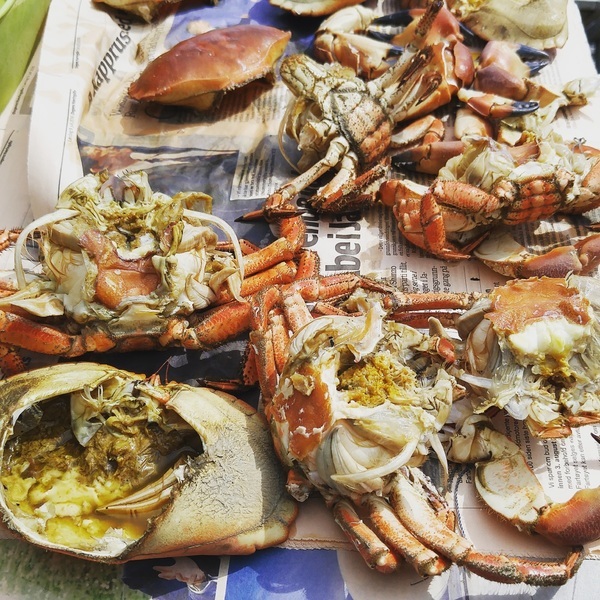 They have large yellow heads and are bigger than mung bean sprouts, which meant that they take longer to cook. Soy beans benefit greatly from sprouting. Sprouting advocates will tell you that the amount of protein and trace minerals in beans dramatically increases for better absorption after sprouting. It also eliminates potential bloating experienced by some people when they consume legumes. In the case of soy beans, sprouting breaks down the tough cellular walls and make the nutrients inside the beans more readily available. Try to buy those still with their roots intact. They should be dry and firm with no unusual smell. Avoid those that have bruises or are limp. Soak them in a large colander to dislodge any dirt and grit. Drain well for use. We typically do not remove the heads, only the roots. As a child, I used to get the bean sprout duty. I still remember being set up on the floor, with pieces of newspapers laid out. Granny would dump the sprouts onto the newspapers. I would then pick them up one at a time, pluck off the roots and then place the sprouts into a colander. When they are all de-rooted, granny will rinse and drain them for use. The roots and the newspapers are wrapped up and thrown away. I must say, it is quite therapeutic. I felt like I "earned" my dinner. Having said that, it is totally optional to remove the roots. They are perfectly safe to eat. If you decide to remove the roots, do so before soaking and cleaning. Add a dash of vinegar when blanching the sprouts. It keeps the sprouts looking perky and plump, and protect the vitamins from being destroyed by cooking. Out of the 5 recipes listed below, recipe 4 and 5 are keto-friendly while recipe 2 and 3 can be too if sugar and cornstarch are left out or substituted with alternative sweeteners. 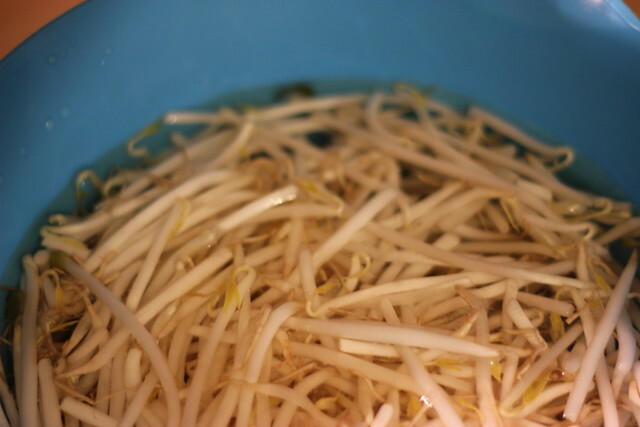 It isn't necessary to have a recipe for cooking bean sprouts in soup. They can be added to practically any type of clear soup. Just wash, clean and drain them for use. Drop a bunch into the boiling soup pot and cook for 10 minutes before serving. Like the beef ball noodle soup with bean sprouts shown below. They also feature prominently in popular Asian soup dishes because of that. Mung bean sprouts are added to laksa, Hokkien prawn noodle, Vietnamese pho soup, Thai rice noodle soup, Japanese ramen and more. Besides clear soup, bean sprouts can be used in a thickened soup like this recipe here. If you are new to thickened soup, click here for some tips and instructions. The sprouts are typically cooked down till they wilt and become very soft. The tomato slices can be added slightly later if you prefer them less mushy although cooking them longer means the soup will be sweeter. Add to the sprouts to thicken up a bit. A typical Asian salad that serves to open up the palate. Combine the sliced vegetables and bean sprouts. Store in a container and place inside the refrigerator to chill. Let it stand for at least 1 day before serving. Chill for no more than 3 days. As the sprouts cook, it will release some moisture which should be sufficient for the pan not to be too dry, but if it seems to be drying up and making stirring it a tad difficult, add a splash of soup stock or water. 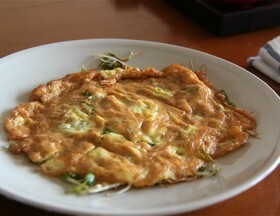 A plate of bean sprouts omelette. This dish is cheap and nutritious. A farm staple. Mung beans are quite easy to sprout. You can use a sprouter machine designed for the purpose or do-it-yourself. 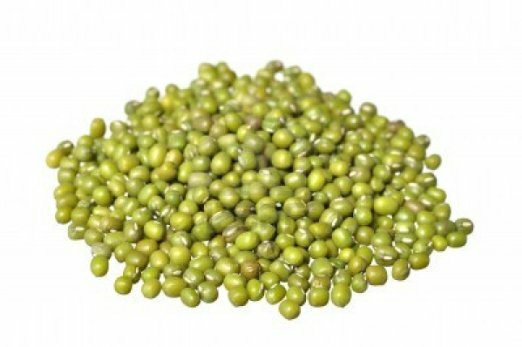 Sprouting mung beans is a good idea because the sprouts are organic and fresh. And because you grew them, you know they are safe to eat. The video below shows Maangchi, a Korean lady growing mung bean sprouts in a flower pot. I think she sprouted too amount (maybe she has a big family to feed) but you can see how a small amount of mung beans can produce such a huge harvest in 5 days. OMG! She also did a video growing soy bean sprouts. It only takes 5 days. 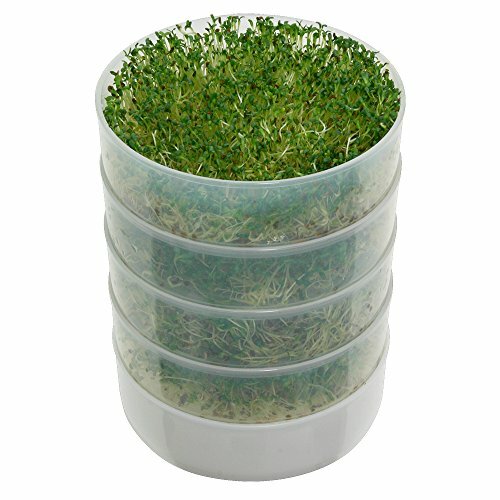 If you think watering the sprouts every 3 hours a tad tedious, then perhaps a sprouter machine might be worth investing in.